The Dark Ranger: Who will stand up for Boogey? Now I don't want to be one to stir the pot. Especially with the wound so deep and obviously fresh with the passing of our fallen enforcer... but I'm glad this came out and kudos to Big George Laraque for putting this out there. “He was cleared to play at the end of the season and the team just told him to take the rest of the year off,” Laraque told NHL HOME ICE on SiriusXM Radio. “You know how much pressure that puts on a guy? He was ready to play with the contract he had and the team says, ‘It’s OK, just take the rest of the year off.’ On top of that, he told me his coach was not a big fan of him. ............He told me John didn’t really like him as a player,” Laraque said. “I don’t know what John thought or what he said. Having been my suspicion for a while, I have to say I am deeply disappointed in the organization, the coach and that these are decisions being made for our team. I hope this makes the direction of our organization, transparent. I'm loving the infusion of youth and watching guys develop within the organization, but watching half a team enabled to play double time while the other half containing some integral pieces, sit idle in the dog house waiting for the coach to smile upon them is BULL$HIT!!! Now i'm not saying that Boogaard should have been activated and put on the first line, but I think we all took notice of how certain players were played regardless of what else was happening on the ice this year... how it later impacted our team. Guys like Avery rode the bench despite being one of only few fired up players for getting penalties that a guy like Dubinsky got routinely without being admonished for... a guy like Prust was played (fighting heavyweights, playing shorthanded, even strength) till he was falling apart at the seams... A scorer like Gaborik made to freewheel it on the wing with no set up pass, or big body to pave the road or screen the goalie, because everyone else on the ice went to the boards and waited for dump. It goes without saying a guy like Boogey could have taken on some guys that Prust got mixed up with, taken some opposing players out of the play and did some intimidating on the ice... had this game been played with some of the fervor it used to... before this became Tortorellas band of mad scramblers and half sized grinders. Now this isn't me playing Monday morning quarterback. There were plenty of times I cheered this team and their underdog persistence... and there were some that I felt I had to for the sake of Morale. The sad fact is, I must make an admission of my own now, that I didn't really feel like this was my team, this season. There are certainly players I would call my players and others that I would still call likeable... but that is a far cry from a team. I'm sure the resemblance was there through the Tortarella looking glass. However, if you asked me to name the lines, I couldn't really ... as the mix and match went on so often that the only lines that ever stuck were those that showed instant chemistry and dug us out of a whole through one of our many comeback wins. If all the juggling and slight of hand had been taken out of the line making process... we'd see that many live guys were simply inserted to dead lines for the sake of keeping the flow of the game rolling. This is not the multifaceted gem that can epitomize an NHL team... 1st line scorers, 3rd line energy guys, 4th line grinders... It was the same group of players wearing 3 different hats a night while the other players watched and tried figure out where they fit in. Thanks for the heads up, Boogey(special thanks to BGL)... RIP Big man... Once a Ranger Always a Ranger. P.S. - I also found it particularly disappointing that so many fans can start talking about Boogeys cap hit and money situations instead of the type of person and inspiration he was as a human being. Here's to hoping the Rangers honor their contract to him and the money goes to where he would like it. Thanks Bill. At such a sad time its unfortunate to have to think about what ails the team, however I don't think there could be a bigger red flag that Laraque's comments. Especially when so many fans are thinking the problem is inexperience or scoring. I have always been a fan and this is truly some of your best work. Keep it up, brother. Thanks Francis, Good to hear from you. How are you? So it finally came out and his death was caused by pain pills and alcohol.He was always in pain and he took pain pills which are highly addictive and also drank alcohol which your not suppose to do.Lets face it how many people who get pain pills actually listen when told not to drink? It's just something thats done,it's not smart but it's done all the time.Unfourtunately it killed a great guy in Derek.Now all you losers can start your assault on Derek,because you are losers. I instead see it as a terrible accident and won't let it dim or ruin my feelings for a great man who just wanted to play hockey. I will remember all the people he has touched in a positive manner instead of how he died.How he died should be a lesson to all of us but it should never ever ruin his memory and all the wonderful things he did for his teammates,family and fans who just enjoyed watching him.I will remember that silly little song and dance he did at the build a bear store,and of course the giant holdinding hands with the little girl going into the store.If you are a good person thats the Derek you should remember along with being the toughest SOB in the NHL.For all of those who want to throw mud I say your all aholes for doing it and that includes Brooks from the Post. I hope his family can get threw this terrible tradgedy and realish how gret a man there son Derek was and always will be in the minds of true fans who Loved him.RIP Boogyman !!!!!!! Well said J, I haven't posted here before but have been reading here quite a while. I'm glad you brought this out. 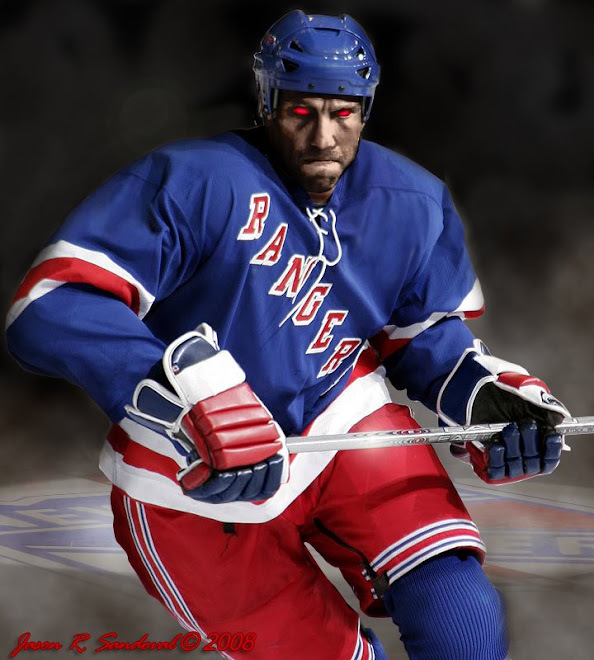 I have always been a Ranger, but i'm not exclusive to the club, and I have always been a fan of the Boogeyman. That something like this happened to a man like Derek is saddening and it's almost impossible to get a word in edgewise through all the people screaming fire Sather, begging for what they want him to do with the team and then complaining once he does it. Anyways, a great article by a great writer, keep up the good work J.